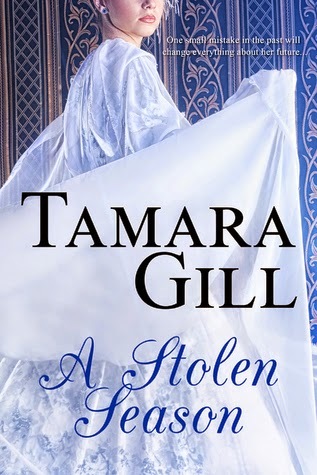 I'd like to welcome Tamara Gill, author of A Stolen Season, to the blog today for a short interview. What made you decide to starting writing – and why romance? I started to write romance after walking past some books in a shop and a novel, with the most beautiful Empire style gown caught my eye. I bought the book, which happened to be a Stephanie Laurens novel. Wow. Fell instantly in love with the Cynsters and my love of romance novels was born. After that, stories of my own started to form in my mind, and I decided to write some of them down. It was the beginning of my own romance with writing, which will be a life-long love. If you could visit any period in time when would that be? The Regency period would have to be my favorite period in time. And it’s not because of what wars were won and lost in that time, who was on the English throne, or because of the scandals Lord Byron was causing, but because of the gowns. Since seeing the Empire style gown for the first time, I wanted to know what period had dresses like that. It all comes down to the fashion I’m afraid. Do you find it difficult to write across several romance genres? How do you get your mind to change gears? I write across different genres, and I hope I do it well. I don’t find it difficult, but I do check facts when writing in historical periods, but not before starting the book, I do it during. I like writing across different time periods as it never leaves me bored. There is always something new to explore, different speech colloquialisms to use and of course, the hero’s are products of their time, so it makes for interesting conflicts with the heroine. As a fan of historical sites – what are a few of your favorites? Are there any popular historical shows that you just have to watch? I’m currently addicted to Reign about Mary Queen of Scots. I love Reign, in fact, I had to ban myself from watching it all the time as I was getting no writing done. I also love historical movies, Jane Austen ones especially. Outlander is a given, I’d marry Sam Heughan…oops I mean, Jamie tomorrow. The White Queen miniseries was fantastic, and I loved the play of families that show portrayed, and not always favourably either. If it’s an historical movie, of any era, I’m there. I’m an Aussie. I’m a bit of both. Cats, dogs or something else? Archaeologist Sarah Baxter just broke one of the biggest rules of time travel: leaving a piece of 21st-century equipment in 19th century Regency England. Unfortunately, when she goes back to retrieve it, she makes an even bigger mess of things—resulting in the death of an English earl. Now his brother is not only out for revenge, but he also has Sarah's device. Which means an entirely different approach. Tamara is an Australian author who grew up in an old mining town in country South Australia, where her love of history was founded. So much so, she made her darling husband travel to the UK for their honeymoon, where she dragged him from one historical monument and castle to another. A mother of three, her two little gentleman's in the making, a future Lady (she hopes) and a part-time job keep her busy in the real world, but whenever she gets a moment's peace she loves to write romance novels in an array of genres, including regency, medieval and paranormal. Tamara loves hearing from readers and writers alike. You can contact her through her website, and sign up to follow her blog or newsletter.